Bridal Jewellery Goals - Unique Bridal Jewellery Designs We’ve Seen On Brides! Polki Jewellery and gorgeously carved gold has always dominated the bridal jewellery market in India but as we scooped through wedding ideas – we came across some of the most stunning bridal jewellery designs. 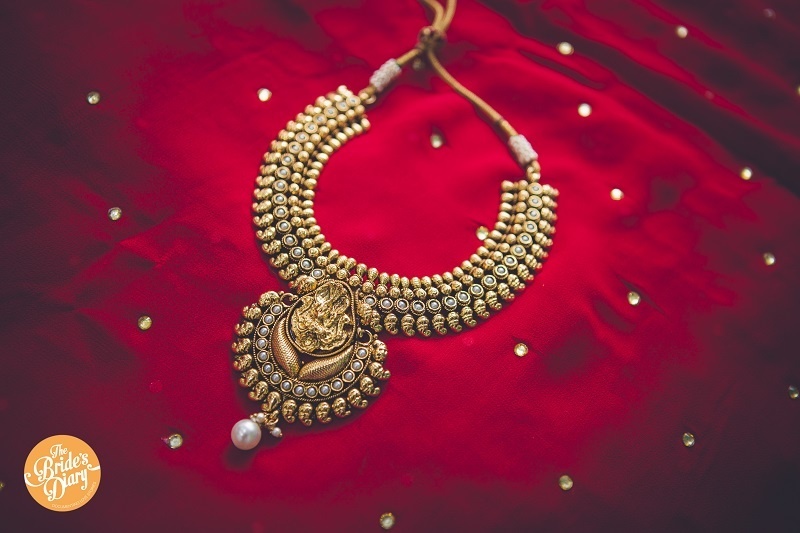 ranging from cutwork gold chokers to meenakari necklaces, temple jewellery and Kempu too – these bridal jewellery designs had us completely mesmerized! They were classic, yet had a touch of the extraordinary making them a perfect fit for contemporary-chic brides who don’t always play by the rules. These unique bridal jewellery designs are handpicked from Real brides on our Real Weddings section. These brides opted to take their bridal jewellery game up a notch, making a bold statement just through their accessories – now isn’t that what being a game-changer is all about! Some of their choices completely left us spell bound. Like Real Bride Veda’s high-neck choker styled gold-ruby-emerald necklace and real bride Aditi’s diamond shaped maangtikka with a stunning pearl drop – scroll down to see all this and more! Diamond patterned over-sized maathapatti! Just. Plain. Gorg. Multiple layers of all-gold beads - WOW! Paankh styled kempu jewellery - Rajasthan meets South Indian! Paisley drops on temple jewellery is love! Flower patterns + gold beads + delicate crystals = Beauty! This bridal jewellery set is all about royalty! Multi-strands of rubies and diamonds put together make for an extravagant jewellery set! This stunning bridal necklace is one fit for the gods! Maroon tear-drop beads on floral gold patterns - this bridal necklace is one for the books! Read more on bridal jewellery here! Are Half-Maatha Pattis the Newest Bridal Jewellery Trend?